As I write about the Christmas markets I visited on 2nd Advent weekend, it is now 4th Advent Sunday. We shall celebrate it later this afternoon with a good bottle of wine and some Christmas baking. Last Sunday we celebrated 3rd Advent. Whitey, the small black and white cat who found her way into our house last December--shortly before Christmas 2012--was mesmerized by the candles. I do love the Christmas markets even though I only visited two this year. Too many other things were going on as well. Many of the markets in the cities go on until December 23rd. The ones I went to, though, are just weekend affairs and they are favourites of mine. 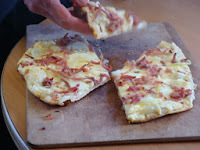 Those favourites always happen on the same weekend, which includes Munchweier's, the small town just a kilometer from us. I didn't make it to theirs this year, but I did get there in 2012 and most other years. 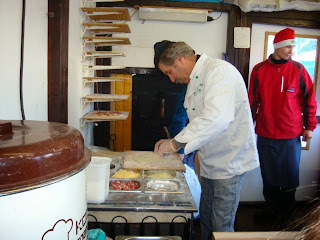 The first market I visited was on Saturday morning, 2nd Advent weekend, at Fischer's in Schweighausen. The market began on Friday and ended on Saturday evening. It is traditional, gemütlich, friendly and everything is made by those who are selling there from the countryside nearby. I bought homemade cookies and spruce boughs, which we buy there each year. At one time we got our own boughs; now we leave that for others to find and to cut for us. Fischer's is renowned for their Trachten dress: typical German traditional clothing, ones that are worn on special occasions and that have been worn for hundreds of years. In earlier years that was nearly always the dress on Sundays and religious holidays; in some parts of Germany, Bayern in particular, the Bavarians still do. I have one such outfit myself, and even though I am not German by birth, I have lived here for many years now. I wear it, for example, during Oktoberfest time. Many others do as well. Hans wears trachten-style jackets and shirts all the time. Three views of the store above and right. My Trachten on the left is with the apron and, of course, it is pulled in tightly there. The one on the right is the same dress but without the apron and not pulled in at all. Below, is the traditional type of scarf worn at the neck. On my dress, the top, above the sleeves and just below the shoulders, remains bare. Not all are. Fischer's store and the local people had spent a lot of time getting ready for this year's market, but then, they always do. It reminds me of the Christmas church bazaars in Canada, many of which I went to in earlier days. they were always welcoming and Christmasy, although the atmosphere wasn't quite the same. The ones here are outdoors; the ones in Canada are generally indoors due to weather conditions. A view of a couple of the booths underneath tenting at left. The gentleman below has been singing Christmas songs and carrols there for several years now. The following pictures show some of the items being offered at the market. To see any of them in a larger format, just click on them. Natural soaps on the left; Schnaps on the right. Cookies and baked loaves on the left; wooden houses on the right. Woman selling wine and children's punch on the left; booths and mistletoe on the right. The young girl below sold me some of her mother's cookies and was excited having sold them. As always, food was offered. 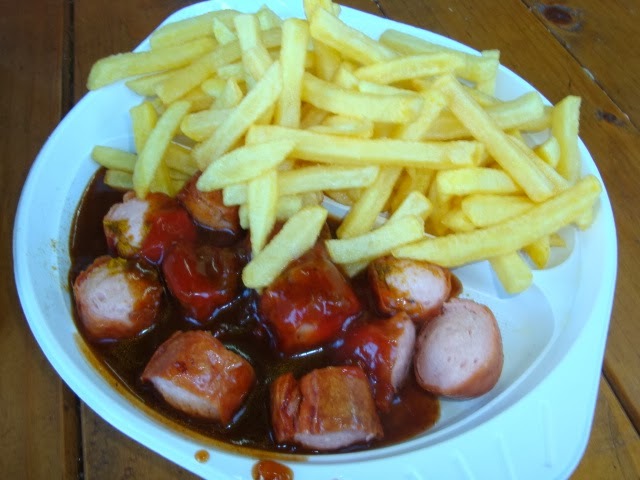 One of my favourites is curry wurst. It is made from Bratwurst that are fried, cut into even-sized pieces and covered with a rich curry and tomato sauce. It is then accompanied by a fresh Brötchen (hard crusted roll, soft on the inside). I, however, always like it with pommes frites. You can make it yourself simply by mixing a good ketchup (I use Heinz) and curry powder together and adding any extra spicing you would like. Kids love it! I love it! It is often found on the Kinder menu card at a Gasthaus. 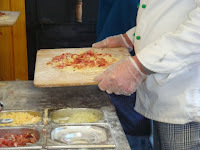 Flammenkuchen, a specialty in our area, was also offered. I wrote about it in a blog post of April 11, 2010. It will tell you almost all you need to know. The following three pictures show it in the process of being made right at the market. On the right, the Schinken (bacon) has been added. On the left, the finished product and ready to eat. On this Saturday morning, the roads were clear, although it was cold. Fischer's is quite high, so often you will find snow there in December. It is almost at the top of the Geisberg (a fairly high mountain), about 15 to 20 minutes east of us. This particular day, there was a scattering of snow along the road and in the hills. The wind felt cold. It was milder where we live, with no snow, and with only a short distance between the two areas. The thermometer below shows it was the 7th of December and just below freezing at -1C. I walked along the snowy pathway shown on the right. It runs along the main road in front of the store. Above, the hillside above and behind Fischer's store. After the market I returned home to warm my hands and then to get ready to head to my next market. It was 2nd Advent.